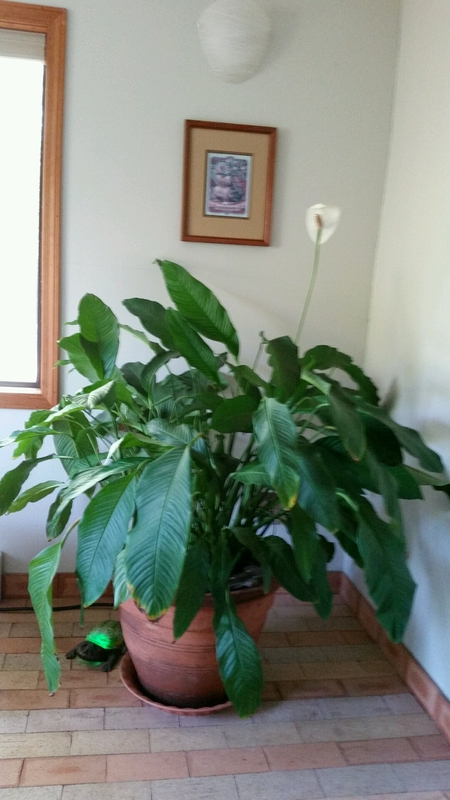 On Monday the husband and I split and repotted an enormous peace lily that lives in his bathroom. Before the surgery, it was 10 - 12 ft. in circumference. I didn't take a picture until we were finished. We covered the floor with plastic and turned the pot on it's side. After a protracted struggle during which I hacked the roots apart, crawled on the tile floor on my hands and knees, picked up the giant plants, and got really dirty, I eventually had two perfectly potted peace lilies. Success you might say. And on the plant front the project worked out well. I sent one pot home with a friend and kept the other. The plant is, after all 25 yrs old and one one of the plants from my mother's funeral. So, I'm attached. However, on the personal physical side of the affair, all that tugging, crawling, and wallowing in the dirt has sent my back into a frenzy of pain. And the pain makes me anxious. Double whammy! I'm working hard NOT to berate myself for doing something that has made me grumpy and pain ridden because with each passing year, I don't seem to have learned my limitations. I'll just ride it out and hope it doesn't last long. Aww, sorry to hear of your distress and hope the discomfort subsides without lasting effects. I've been lucky in that my scripted exercises have helped maintain a sort of tenuous status quo. But every once in a while, I forget that that's how it is, do something stupid, and then have to worry whether I've just established a new, lower, baseline for the quality of my life forever after.